“It’s business, it isn’t personal!” I get tired of hearing that remark. Business is personal. Obviously true if you are in a service industry, but also true if you are in sales. Hmm…what percentage of businesses does that amount to? Probably close to 100%! In these tough times, in any times really, you need to take care of your clients in order to take care of business. Giving a gift is a good will gesture, an acknowledgement. Acknowledgement is a word that goes back to the Old English word acknow, meaning to recognize, to know. By gifting you are telling your clients you know they are important, you recognize them as part of your success and that you appreciate it. It doesn’t have to be elaborate or expensive, but it should be thoughtful. After decades in the gift basket business we have come up with many a gift basket idea. Some of these ended up not being in a basket at all. An exquisite box of chocolates or a good bottle of wine paired with the right cheese might be all it takes to send the right message. The important thing is to send something that stands out from the average, something that says you put some thought into it. 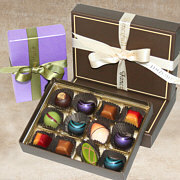 This is precisely why we specialize in artisan gourmet and gift items, things you won’t find in the big box stores. Sure you could get one of those generic gift baskets that are made up months in advance, usually in a foreign country where the labor is cheaper. But so will every one else who is trying to woo your client and your gift will get lost in the shuffle. 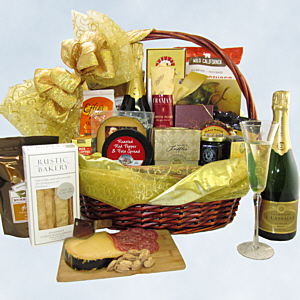 Instead send a gourmet gift basket or a wine gift basket that actually contains delicious foods. We’ve had comments like, “Yours was the only basket where we ate everything in it.” This is what we are going for. We want you to be remembered for sending the good gift basket. Your clients should come to think of you as their partner. You give them first class service. Don’t send a second class gift.